Parents don’t just send their sons to St Vincent’s Castleknock College and leave the rest to the teachers and staff. Far from it. Parents of boys at the college become part of the family that is St Vincent’s Castleknock College. Firstly, each of the six years is represented by a Core Group of parents (10-12 parents representing each class within each year group). They meet about once a month to discuss issues concerning the education and progress of their sons. 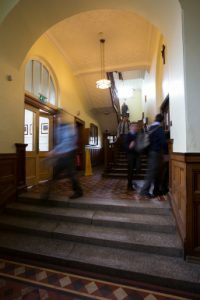 Each Core Group elects two parents to the Parent Representative Association (PRA) which brings important issues to the attention of the Headmaster, who attends all PRA meetings. The Core Groups and PRA are extremely active, their voice is very much heard and they have brought about many changes in college policy. They also organise talks, meetings and seminars, and help with events such as Union Day. Parents can help out in the day-to-day running of the college by assisting with coaching, driving groups of students to matches, supervising the table tennis centre at lunchtime, helping out with events such as Mothers’ Lunches, Dads and Lads breakfasts, and Union Day. If parents are unhappy about the way the college does things, they may contact the teacher, Year Head or even the Deputy Principal and Headmaster and they will always respond positively.